Cleveland Indians relief pitcher Brad Hand delivers a pitch in the ninth inning of a 3-1 win over the Toronto Blue Jays on Sunday in Cleveland. He retired his first nine hitters, walked Socrates Brito leading off the fourth, then gave up a double to Freddy Galvis. Clevinger fanned Randal Grichuk, Rowdy Tellez and Teoscar Hernandez in order, all swinging. He threw 75 pitches in all. 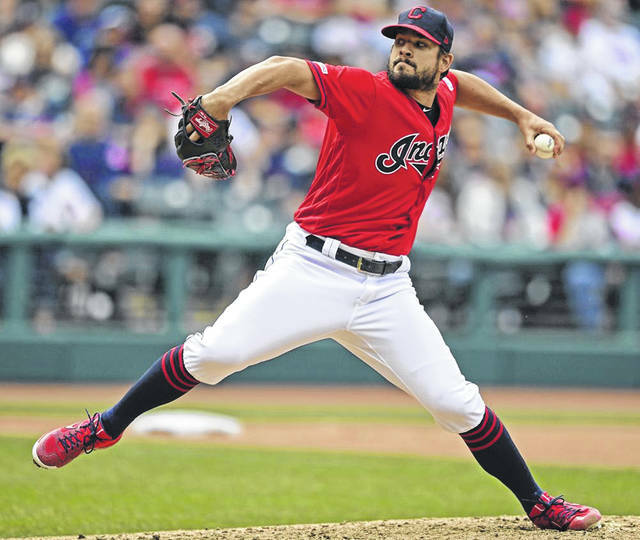 https://www.limaohio.com/wp-content/uploads/sites/54/2019/04/web1_Indians.jpgCleveland Indians relief pitcher Brad Hand delivers a pitch in the ninth inning of a 3-1 win over the Toronto Blue Jays on Sunday in Cleveland.